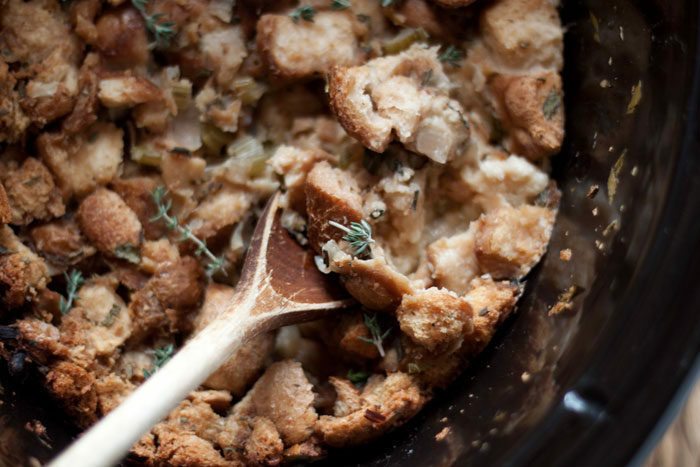 This simple Crock Pot stuffing recipe stays moist in the middle and gets golden-crisp around the edges. Holiday perfection – plus, it’s vegetarian and dairy-free! Two weeks ago, I had a full line-up of Thanksgiving recipe ideas ready to create and share. Two weeks ago, our oven went haywire. The good: it now preheats in 2 minutes flat! The bad: it only runs at one temperature – 550 degrees! Our research revealed that the circuit board went out, and would only cost a mere $500 to replace. So down the rabbit hole of acquiring new appliances we went. We had planned to replace the range at some point to accommodate our future kitchen remodel, after all … just, you know. Not quite yet. We’re about one more week away from our new range installation (fingers crossed). So this span of ovenless time has had me scrambling a bit. I’d planned on developing a ton of Thanksgiving and Christmas recipes, but sure enough, most of them made use of the oven. I decided to embrace the challenge, though. After all, aren’t our ovens already overloaded at Thanksgiving time?! Wouldn’t it be nice to make things on our stove tops or, better yet, our slow cookers? 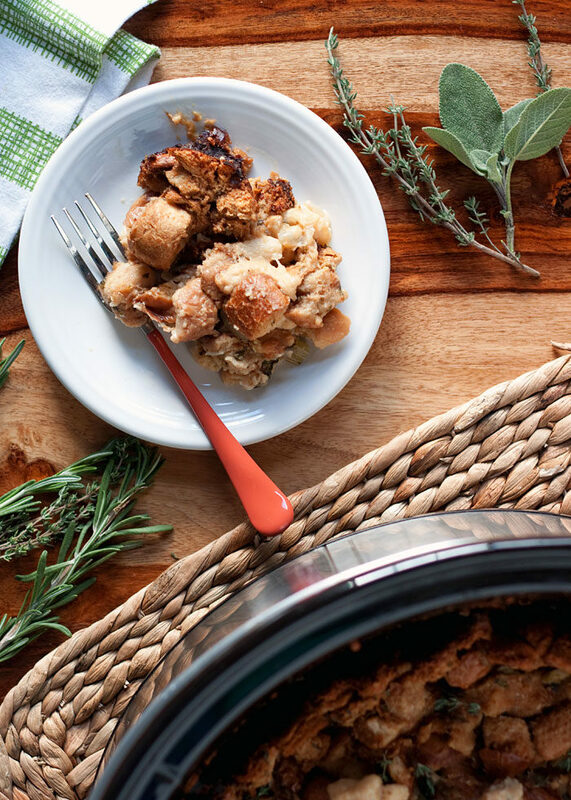 Yup, it was finally time to try my hand at a Crock Pot stuffing recipe. It was something that had been on my mind for awhile. My mom’s been doing it for a couple of years now; Serious Eats sealed the deal. Now, most stuffing recipes make use of copious amounts of butter, and darn if they aren’t delicious because of it. 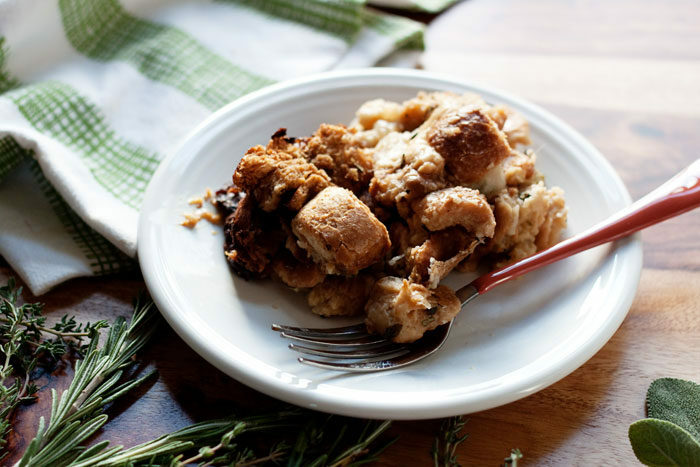 But because of my new dairy-free ways, I wanted to create a dairy-free stuffing recipe – but one that is tasty enough for everyone to enjoy. I thought about omitting the egg to make it a full-on vegan deal, but ultimately decided to leave the egg in. Next year, perhaps, I’ll tackle that one. Then we have sourdough bread, mostly … mixed in with some mild-mannered French. 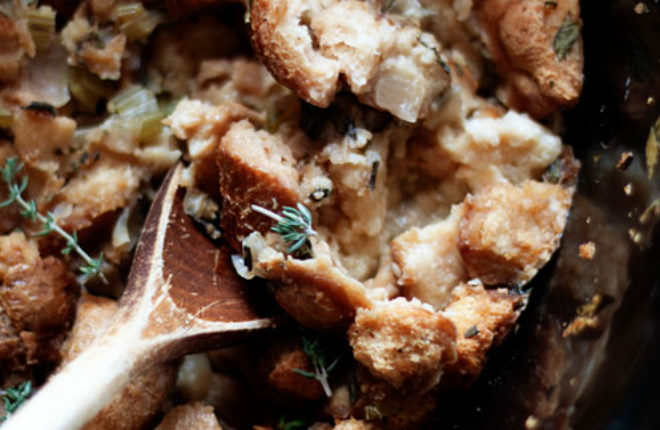 This is a simple, straightforward, and pretty classic stuffing recipe. No fancy stuff, just great Artisan bread, veggie broth, fresh herbs, and a good stint in the Crock Pot. Who needs ovens?!! Okay, we do. Desperately. But not for our stuffing! 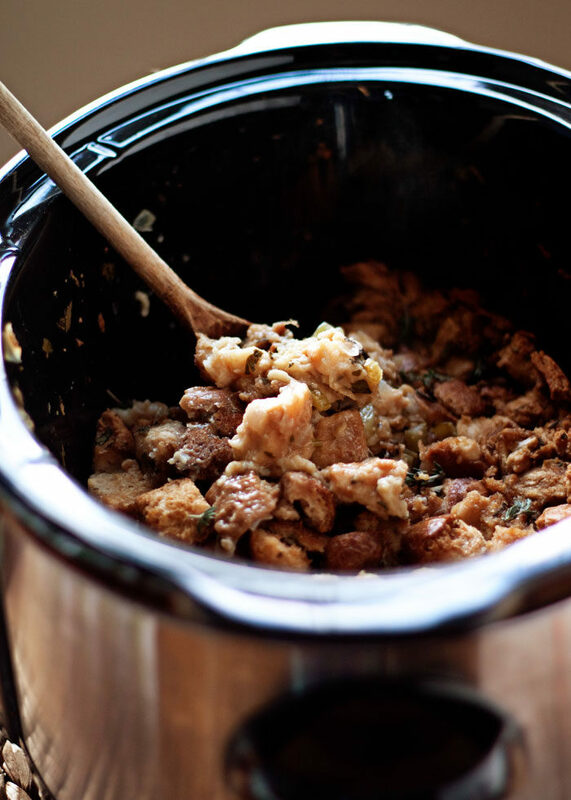 Crock Pot stuffing cooks a little differently than oven-baked stuffing. It gets crisper around the edges (yum), and moister in the middle. You want to take care to not add too much broth, or things might end up too much on the soggy side. Watch it carefully toward the end of the cooking time – depending on your individual slow cooker, the edges could go from deliciously crunchy to burnt. I like to use my large, oval, 6-quart slow cooker for stuffing. More coveted stuffing edge to go around! Grease the bottom and sides of the Crock Pot with olive oil. Preheat oven to 375 degrees. Spread bread cubes onto two rimmed cooking sheets and bake, stirring once, until crisp, about 10 minutes. You can also dry the bread cubes out without using the oven. Just cut the bread into chunks and let it sit at room temperature for 24-48 hours, until hard. Add the bread cubes to the slow cooker. Set a large saute pan over medium-high heat. When hot, add the olive oil, then the onion and celery. Saute until tender and lightly browned, about 7 minutes. Add the garlic and cook, stirring, for 1 minute. Remove from heat and add the broth, stirring to scrap up any remaining brown bits of onion. Let the broth mixture cool to room temperature. Add the parsley, sage, rosemary, thyme, salt, pepper, and egg. Beat with a whisk until blended. Pour the broth and veggie mixture over the bread crumbs. Use a wooden spoon or spatula to gently stir until evenly distributed. Add additional broth, 1/4 cup at a time, until the bread is almost entirely soaked and is no longer crunchy, but not so much that there is broth pooled at the bottom of the slow cooker. The bottom of the slow cooker should still be relatively dry. Cook on low for 4-6 hours, until the edges are golden brown. 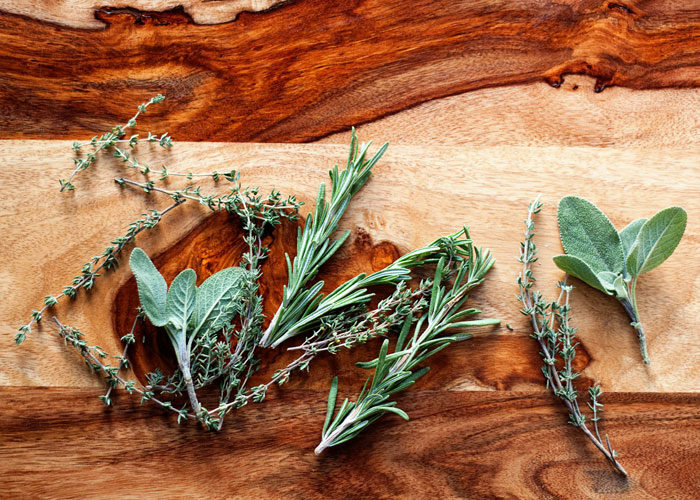 Top with fresh herbs before serving, if desired. Sub butter for the olive oil, if desired. 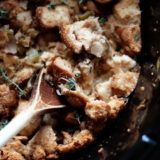 @Nicole- The Serious Eats website linked above has a vegan stuffing that just uses olive oil, no butter or eggs. I’m sure the same would work with this recipe. There are also vegan recipes for egg nog using coconut milk.